حیدری‌زاده, نسرین, بهروز, بهروز. (1396). ویژگی‌های همه‌گیر شناسی و بالینی باورهای وسواسی و اختلال وسواسی-اجباری در دانش‌آموزان 17-8 سالۀ شهر کرمانشاه، سال 1394. 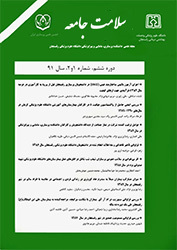 سلامت جامعه, 9(4), 49-61. نسرین حیدری‌زاده; بهروز بهروز. "ویژگی‌های همه‌گیر شناسی و بالینی باورهای وسواسی و اختلال وسواسی-اجباری در دانش‌آموزان 17-8 سالۀ شهر کرمانشاه، سال 1394". سلامت جامعه, 9, 4, 1396, 49-61. حیدری‌زاده, نسرین, بهروز, بهروز. (1396). 'ویژگی‌های همه‌گیر شناسی و بالینی باورهای وسواسی و اختلال وسواسی-اجباری در دانش‌آموزان 17-8 سالۀ شهر کرمانشاه، سال 1394', سلامت جامعه, 9(4), pp. 49-61. حیدری‌زاده, نسرین, بهروز, بهروز. ویژگی‌های همه‌گیر شناسی و بالینی باورهای وسواسی و اختلال وسواسی-اجباری در دانش‌آموزان 17-8 سالۀ شهر کرمانشاه، سال 1394. سلامت جامعه, 1396; 9(4): 49-61. 2باشگاه پژوهشگران جوان و نخبگان، واحد کرمانشاه، دانشگاه آزاد اسلامی، کرمانشاه، ایران. مقدمه: اختلال وسواسی-اجباری (Obsessive-Compulsive Disorder) کودکان یک اختلال روانی-عصبی مزمن و ناتوان‌کننده است که با اختلال قابل توجهی در عملکرد روانی-اجتماعی همراه است. هدف پژوهش حاضر بررسی ویژگی‌های همه‌گیرشناسی و بالینی باورهای وسواسی و OCD در دانش‌آموزان 17-8 سالۀ شهرکرمانشاه بود. مواد و روش‌ها: پژوهش از نوع مقطعی می‌باشد. جامعۀ آماری شامل کلیۀ دانش‌آموزان 17-8 سالۀ شهرکرمانشاه، سال 1394 در مقاطع ابتدایی و متوسطۀ اول بود. با روش نمونه‌گیری خوشه‌ای چندمرحله‌ای، 762 نفر انتخاب و پرسشنامه‌های متغیرهای جمعیت‌شناختی، باورهای وسواسی (OBQ-CV)، و اختلال وسواسی/ اجباری (OCI-CV) تکمیل گردیدند. داده‌ها با روش‌های آمار توصیفی، ضریب همبستگی، آزمون مجذور کای و رگرسیون لُجستیک تحلیل شد. یافته‌ها: میزان شیوع OCD همراه با OB در کل نمونه 80/16%، در دانش‌آموزان دورۀ متوسطۀ اول 19% و ابتدایی 50/14% بود. میزان شیوع در پسران بیشتر از دختران(041/0=p)، و در دورۀ متوسطۀ اول بیشتر از ابتدایی بود (036/0=p). همبستگی بین OB و OCD از نظر آماری معنی‌دار بود(05/0>p). بین زیرمقیاس‌های OB، بیش‌برآورد تهدید، شایع‌ترین و اهمیت/کنترل فکر، کم‌ترین شیوع اما بین زیرمقیاس‌های OCD، افکار وسواسی، شایع‌ترین و خنثی‌سازی، کم‌ترین شیوع را داشت. بین همۀ عوامل جمعیت‌شناختی، به‌جز نوع تولد رابطۀ معنی‌داری با شیوع OB و OCD وجود داشت(05/0>p). نتیجه‌گیری: شیوع OB و OCD در دانش‌آموزان شهرکرمانشاه در مقایسه با سایر پژوهش‌های انجام گرفته در داخل و خارج از کشور قابل ملاحظه است (80/16%). با این وجود، لزوم سیاست‌گذاری‌های سلامت ‌روان در دانش‌آموزان برای کاهش بار آسیب در آینده و ارایۀ راه‌کارهای برون‌ رفت از این مسئله به قوت خود باقی است. 1Lecturer, Dept. of Psychology and Educational Sciences, University of Payame Noor, Tehran, Iran. 2Young Researchers and Elite Club, Kermanshah Branch, Islamic Azad University, Kermanshah, Iran. Introduction: Obsessive-compulsive disorder in children is a neuropsychiatric condition that is associated with considerable psychosocial impairment. The aim of this study was to investigate the epidemiology and clinical features of obsessive beliefs and obsessive-compulsive disorder in 8-17 year old students in kermanshah city. Material and Methods: The statistical population for this cross-sectional study included all the primary and first grade high school students (8-17 years old) in Kermanshah city in 2015. through multi-stage cluster sampling, 762 patients were selected. Demographic information and OBQ-CV and OCI-CV questioners were completed for each one of them. The data was analyzed using descriptive statistics, correlation coefficient, chi-square test and logistic regression. Results: The Results showed that prevalence of OCD and OB in the total sample was %16.80, and in the guidance school students was %19 and for the primary school students it was %14.50. The prevalence was higher in boys versus girls (p=0.041), and in the guidance school students was higher than the primary students (p=0.036). The correlation between OB and OCD was statistically significant (p<0.05); Also, the results showed that in the subscales of OB, overestimation threat was the highest and Importance/thought control was the lowest prevalence. But between the subscales of OCD, Obsession was the highest and Neutralizing had the lowest prevalence. All the demographic factors, except the type of birth had a significant relationship with the prevalence of OB and OCD (p<0.05). Conclusion: The Prevalence of OB and OCD in the students of Kermanshah city was significant in comparison with the other studies conducted within and outside the country. However, attention should be paid to mental health policy-making in students to decrease the behavioral problems and prevent future problems. Fenske JN, Petersen K. Obsessive-Compulsive Disorder: Diagnosis and Management. American family physician 2015; 92(10):896-903. Devriese J, Dhar M, Walleghem D, van West D. Hallucinations and obsessive behaviour in an infant with autism spectrum disorder: diagnostic problems. Tijdschrift voor psychiatrie 2015;57(8):608-12. Oberbeck A, Steinberg H. Are the current concepts of obsessive disorders a novelty? From Westphal (1877) and Thomsen (1895) to ICD-10 and DSM-5. Der Nervenarzt 2015; 86(9):1162-7. Vivan AdS, Rodrigues L, Wendt G, Bicca MG, Braga DT, Cordioli AV. Obsessive-compulsive symptoms and obsessive-compulsive disorder in adolescents: a population-based study. Revista Brasileira de Psiquiatria 2014;36(2):111-8. Halvaiepour Z, Nosratabadi M. External Criticism by Parents and Obsessive Beliefs in Adolescents: Mediating Role of Beliefs associated with Inflated Responsibility. Global journal of health science 2016;8(5):125-33. Krause D, Folkerts M, Karch S, Keeser D, Chrobok AI, Zaudig M, et al. Prediction of Treatment Outcome in Patients with Obsessive-Compulsive Disorder with Low-Resolution Brain Electromagnetic Tomography: A Prospective EEG Study. Frontiers in psychology 2015; (6):1993-12. Jacobson NC, Newman MG, Goldfried MR. Clinical Feedback About Empirically Supported Treatments for Obsessive‐Compulsive Disorder. Behavior therapy 2016;47(1):75-90. Rady A, Salama H, Wagdy M, Ketat A. Obsessive compulsive phenomenology in a sample of Egyptian adolescent population. The European Journal of Psychiatry 2013;27(2):89-96. Adam Y, Meinlschmidt G, Gloster AT, Lieb R. Obsessive–compulsive disorder in the community: 12-month prevalence, comorbidity and impairment. Social psychiatry and psychiatric epidemiology 2012;47(3):339-49. Torres AR, Fontenelle LF, Shavitt RG, Ferrão YA, do Rosário MC, Storch EA, et al. Comorbidity variation in patients with obsessive–compulsive disorder according to symptom dimensions: Results from a large multicentre clinical sample. Journal of affective disorders 2016;190:508-16. Belloch A, Morillo C, Luciano JV, García-Soriano G, Cabedo E, Carrió C. Dysfunctional belief domains related to obsessive-compulsive disorder: a further examination of their dimensionality and specificity. The Spanish journal of psychology 2010;13(1):376-88. Coles ME, Schofield CA, Nota JA. Initial Data on Recollections of Pathways to Inflated Responsibility Beliefs in Patients with Obsessive-Compulsive Disorder. Behavioural and cognitive psychotherapy 2015;43(04):385-95. Salkovskis PM, Kobori O. Reassuringly calm? Self-reported patterns of responses to reassurance seeking in obsessive compulsive disorder. Journal of Behavior Therapy and Experimental Psychiatry 2015; 49(2):203-8. Nowakowska‐Domagała K, Chodkiewicz J, Ziółkowski M, Czarnecki D, Gąsior K, Juczyński A, et al. The Polish Version of the Yale‐Brown Obsessive–Compulsive Scale, Modified to Reflect Obsessions and Compulsions Related to Heavy Drinking (YBOCS‐hd‐PL). Alcoholism: Clinical and Experimental Research 2016;40(2):401-7. Lack CW, Storch EA, Keeley ML, Geffken GR, Ricketts ED, Murphy TK, et al. Quality of life in children and adolescents with obsessive-compulsive disorder: base rates, parent–child agreement, and clinical correlates. Social Psychiatry and Psychiatric Epidemiology 2009;44(11):935-42. Masi G, Millepiedi S, Perugi G, Pfanner C, Berloffa S, Pari C, et al. A naturalistic exploratory study of the impact of demographic, phenotypic and comorbid features in pediatric obsessive-compulsive disorder. Psychopathology 2010;43(2):69-78. Mataix-Cols D, Nakatani E, Micali N, Heyman I. Structure of obsessive-compulsive symptoms in pediatric OCD. Journal of the American Academy of Child & Adolescent Psychiatry 2008;47(7):773-8. Coles ME, Wolters LH, Sochting I, De Haan E, Pietrefesa AS, Whiteside SP. Development and initial validation of the obsessive belief questionnaire‐child version (OBQ‐CV). Depression and Anxiety 2010;27(10):982-91. Nogueira AR, Godoy ÁA, Romero SP, Gavino LA, Cobos ÁM. [Psychometric properties of the Spanish version of the Obsessive Belief Questionnaire-Children's Version in a non-clinical sample]. Psicothema 2012;24(4):674-9. Foa EB, Coles M, Huppert JD, Pasupuleti RV, Franklin ME, March J. Development and validation of a child version of the obsessive compulsive inventory. Behavior therapy 2010;41(1):121-32. Güler AS, do Rosário MC, Ayaz AB, Gökçe S, Yulaf Y, Başgül S, et al. Psychometric properties of the DY-BOCS in a Turkish sample of children and adolescents. Comprehensive psychiatry 2016;65:15-23. Paul I, Sinha VK, Sarkhel S, Praharaj SK. Co-morbidity of obsessive-compulsive disorder and other anxiety disorders with child and adolescent mood disorders. East Asian Archives of Psychiatry 2015;25(2):58-63. Angst J, Rufer M, Fineberg N, Ajdacic-Gross V, Rössler W. Obsessive-compulsive disorder: prevalence, comorbidity and remission from the ages of 20 to 50. Praxis 2015; 104(24):1323-8. Tan O, Tas C. Symptom Dimensions, Smoking and Impulsiveness in Obsessive-Compulsive Disorder. Psychiatr Danub 2015;27(4):397-405. Abramovitch A, Dar R, Mittelman A, Wilhelm S. Comorbidity between attention deficit/ hyperactivity disorder and obsessive-compulsive disorder across the lifespan: a systematic and critical review. Harvard review of psychiatry 2015;23(4):245-62. Lebowitz ER, Panza KE, Bloch MH. Family accommodation in obsessive-compulsive and anxiety disorders: a five-year update. Expert review of neurotherapeutics 2016;16(1):45-53.